The genus Humulus likely originated in Mongolia at least six million years ago. A European type diverged from that Asian group more than one million years ago; a North American group migrated from the Asian continent approximately 500,000 years later. Five botanical varieties of lupulus exist: cordifolius (found in Eastern Asia, Japan), lupuldoides (Eastern and north-central North America), lupulus (Europe, Asia, Africa; later introduced to North America), neomexicanus (Western North America), and pubescens (primarily Midwestern United States). Varieties European brewers identified early on as outstanding, such as Saaz and Spalt, were Humuplus lupulus. When the first settlers arrived in North American they brewed beer with hops (Humulus lupuldoides) they found growing wild, but also used hops (lupulus) they brought from Europe. 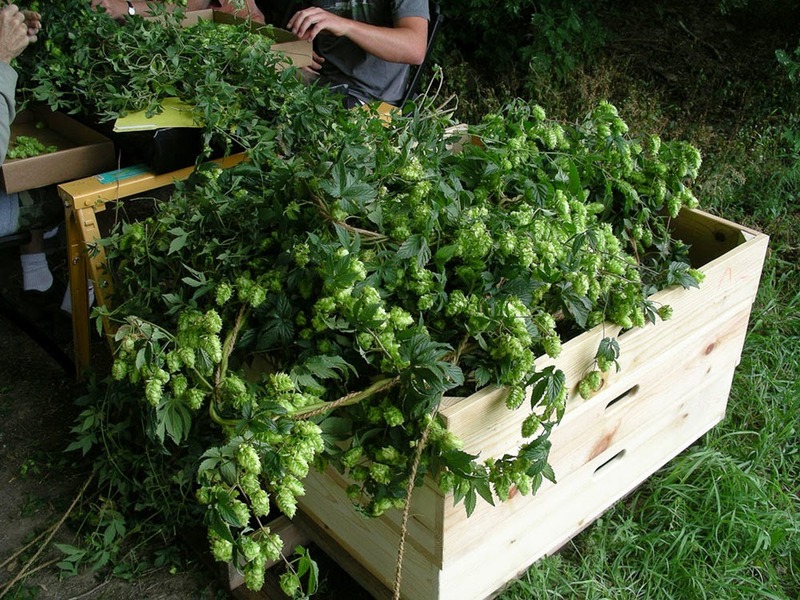 Not surprisingly, native and imported hops cross-bred naturally. As recently as 1971, Cluster — one of the hops that resulted — accounted for nearly 80 percent of U.S. hop acreage. (If that doesn't sate your appetite, there's more here.) The people selling these hops are monks, and owing to the iron law of supply and demand, I ended up paying a mint for my 3.5 ounces. No worries--I'm happy to pay the price to be an early adopter. What's significant about the pricing part of the story is that it dictated which variety I chose--Latir, the highest-alpha variety (7.2%) they had left. I figured it would be just enough to single-hop a batch and see what they smelled and tasted like. Different groups have used different methods to try to taxonomize the aromas and flavors in hops (there are various wheels and graphs out there). I'd like to contribute to this philosophical tradition by adding a system that divides hops into either "high" or "low" varieties. In my experience, different hops either have bright, light, "high" notes (think Hallertauer, East Kent Goldings, Cascade) or are heavy, resinous, sticky and "low" (CTZ, Centennial, Summit). I point out this dichotomy because typical flavor and aroma elements (citrus, pine, fruit) may be found in hops of either high or low type. What flavor alone fails to account for is this high/low distinction. All of this is relevant because I have rarely encountered a hop as low as Latir. It is an amazing variety. The aroma is extremely dense and resinous--and strong. It will easily fill up the space between two drinkers as they sip a pint. It's a strongly herbal hop, and I mean that partly in the Jamaican sense. But Sally pointed out that what first struck me as marijuana was actually much closer to sage. It also has quite a bit of orange in it, though more marmalade than fresh fruit. I picked up some grassiness as well. The flavors seem very American. In a single-hop beer, Latir overwhelms--though I suspect there are a number of people who would love its intensity. But it has so much character, it would be wonderful in a supporting role, along with some "high" varieties to lighten and brighten the beer up. It's an IPA hop--too big and brassy to play a bit part in more mildly-hopped styles--and in that way seems very contemporary. I wasn't expecting much. Just because a hop comes from wild strains doesn't mean it will be any good, and the grass-roots background of these hops made me wonder if they would have been hybridized into anything approaching a commercial palate. But these are badass hops, and I would happily use them regularly if they were available. (Though probably not at $5 an ounce.) All in all, a most exciting find. Update. By amazing coincidence, this arrived in the mailbox about two hours after my post went live. I also got in on the Neomex hops last fall, though I bought a few varieties. I used Latir for 60, Tierra for 10, and Amalia at flameout and dry hop, also for an IPA. Lots of tropical fruit with a bit of woodsy mint, and some herbal/floral character in there, too. Really complex, and different from any pale ale or IPA I've had. But yeah, not cheap - I bought nine ounces at $50 shipped, and used half in that IPA. Definitely a special occasion beer. What Can We Learn From 170-Year-Old Beer?